Natural vegetation and gardens not only save water resources, but also save on yard maintenance. Did you know Upper Saranac Lake is drinking water? The NYS Department of Environmental Conservation has given Upper Saranac Lake a Waterbody Classification of Double A (AA), indicating that the water is suitable for using as a drinking water supply, also referred to as potable water. Everything flows down to the lake! 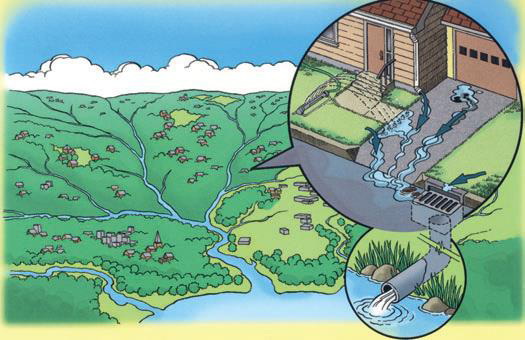 Pollutants on roads, driveways, sidewalks and lawns can wash into streams and storm drains which empty into the lake. Common pollutants include oil/gas, pesticides, fertilizer, pet waste and effluent from failing septic systems. Smaller lawns surrounded by landscaped areas increase the retention of stormwater runoff from impenetrable surfaces such as roofs or driveways. Careful placement of trees can reduce heating and cooling costs. Use native plants to decrease the need for watering. Landscape the slope to the water’s edge into rain gardens utilizes stormwater runoff to naturally water plants. Use the dish washer and washing machine only when full. Filling a bathtub uses almost 70 gallons of water, while taking a 5-minute shower uses around 15 gallons.